There are many bamboo trees on the Yellow Mountain Peak. The large ones are like rafters. The bamboo artisans split them in half, chisel out the partitions, and use them to replace ceramic shingles. The roofs of all the houses in this area are made of bamboo shingles because they cost less in labor and material. In the north-east corner of my town, the parapet of the city wall had disintegrated. The place was desolate, dirty and overgrown with weeds. Consequently, I built two small towers which connected to the Tower of Moonlit Waves 2. The two bamboo towers swallow the lights from remote mountains. Their shadows stretch to sip the water flowing over shallows. The serene and vast view from the towers is indescribable. 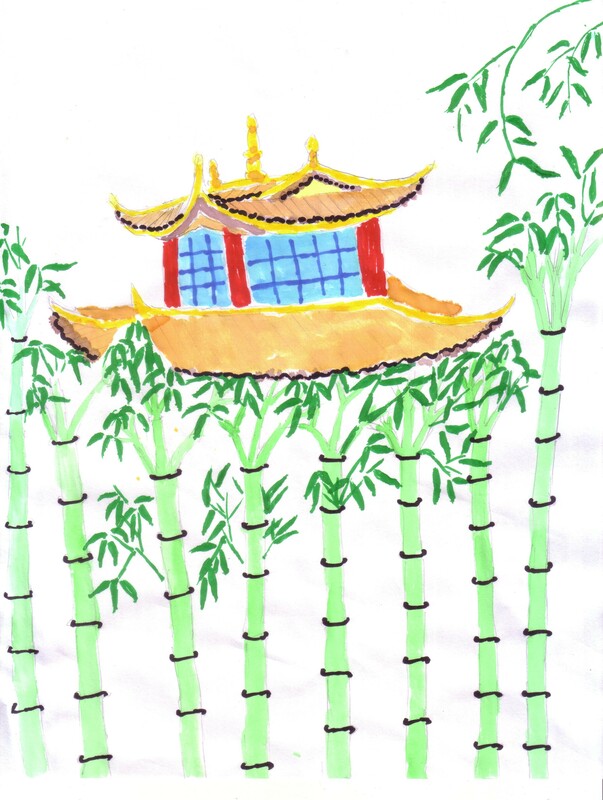 The bamboo towers are suitable for torrential rain in the summer: one can hear the sound of a waterfall when the rain hits their roofs. They are suitable for heavy snow in the winter: one can hear the sound of jade shattering on the ground when the sleet hits the roofs. The bamboo towers are suitable for playing the zither: the tone is harmonious and fluent. They are suitable for reciting poetry: the rhymes are clear and melodious. The bamboo towers are suitable for playing wei-qi 3: the falling pieces sound like someone tapping wood. They are suitable for throwing arrows into a vase 4: the arrows jingle. We can enjoy this cozy atmosphere mainly because the bamboo towers help produce this wonderful variety of sound. During leisure time after work, I dress in a robe made of crane feathers 5, wear a Taoist's cap, and light some incense. Then I sit in silence and read The Book of Changes to repel my sorrows. Other than rivers and mountains, all I see are gulls, sailboats, smoky clouds, and bamboo trees. Having sobered up from drinking wine, I appreciate tea after its steam disappears. After I say farewell to the setting sun, I welcome the moonrise. These are also wonderful moments that I have enjoyed during my exile on the Yellow Mountain Peak. Qi-yun Tower 6 and Luo-xing Tower 7 were much taller than my bamboo towers. Jing-gan Tower 8 and Li-qiao Tower 9 were much more beautiful than my bamboo towers. However, these tall and beautiful towers only harbored prostitutes and were used for nothing but singing and dancing. A good poet is not interested in these sensual pleasures; nor am I.
I heard a bamboo artisan say, "Bamboo shingles can only last ten years. The roof may last twenty years if we use two layers of bamboo shingles." Alas! In 994 CE, I left the Royal Academy and was demoted to Mayor of Chu-zhou City 10. In 995 CE, I was transferred to Guang-ling City 11. In 996 CE, I was reinstated to my former position in the Cabinet of Ministers. On New Year's Eve in 997 CE, I received the order to move to Qi-an City 12. In March 998 CE, I arrived at the Yellow Mountain Peak. During those four years, I constantly moved from place to place and hardly had any time to settle down. I do not know where my work will take me next year. Therefore, I am not worried that my bamboo towers will not last. I hope that the people here with the same values as mine will continue to maintain these towers. May these bamboo towers last forever! 1 Yuan-zhi was Yu-cheng Wang's alternate first name. He was a native of Ju-ye City of Ji-zhou County during the Northern Song dynasty. He was able to write essays at the age of nine. He wrote his poems quickly and alluded to many other works. Shi-an Bi had a high opinion of his talent after reading his poems. In 983 CE, Yu-cheng Wang passed the Advanced Exam at the age of 29. Later, he was appointed as a Judge of the Supreme Court. He and Chu-yue Lo, both born in the same year, composed verses together. Their poems were widely read. Emperor Tai-zong summoned him and selected him as Junior Counselor at the Library of Historical Books. Wang, Jia-zheng Xia-hou, Chu-yue Lo, and Hao-biao Du worked together to revise the Three Historical Books (Chinese History, The History of the Han Dynasty, and The History of the Late Han Dynasty). They corrected many errors. On one occasion Emperor Tai-zong wanted to test poets himself. He summoned Wang to the palace to improvise poetry. It only took a short while for Wang to complete the task. The emperor was very pleased and appointed him to Adviser of the Royal Academy in charge of the Emperor's personal affairs. During the Xian-ping Period, he prepared to revise The Biography of Emperor Tai-zong. He disagreed with the opinions of Prime Ministers Qi-xian Zhang and Hang Li, so he was demoted to Mayor of Huang (yellow)-zhou (city) City. He wrote a poem entitled “I Have Been Demoted Three Times” to express his ideals. 2 "The Tower of Moonlit Waves" was the mayor's office of Huang-gang (yellow mountain peak) City and was built by Yu-cheng Wang. 3 "Wei-qi" is a game with pips of black and white on a board of 361 squares. The object of each player is to surround the pieces of the other so that he cannot move. The game is called Go in Japan. 4 Throwing arrows into a vase was an ancient game. 5 Shi-gong Wang wore a robe made of crane feathers while he was in high spirits. As he walked on snow, passersby mistook him for a god. 6 "Qi-yun" means "on the same level with clouds" in Chinese. "Qi-yun Tower" was built by Pu Han during the Five Dynasties. 7 "Luo-xing" means "falling stars". 8 "Jing-gan" means "a lattice of wood pieces". Emperor Wu-di in the Han dynasty built Jing-gan Tower. It was 50 feet tall and was built in a lattice of ten thousand wood pieces. 9 "Li-qiao" means "beautiful tower". Li-qiao Tower was built by Cao Cao, Emperor Wu-di in the Wei dynasty. 10 Chu-zhou City is now called Chu-xian City and is located in Anhui Province. Yu-cheng Wang was an Adviser of the Royal Academy in charge of the Emperor's personal affairs. Because he criticized the extravagance of Queen Xiao-zhang's funeral, he was demoted to Mayor of Chu-zhou City. 11 Guang-ling City was located northeast of present day Jiang-du City in Jiangsu Province. 12 Qi-an City is now called Huang-gang City and is located in Hubei Province.